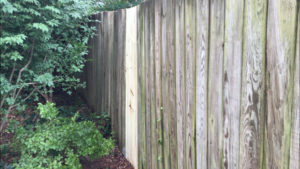 Leaning or sagging fences are a very common problem in backyards. If left unaddressed, unsupported fences can even detach completely and fall apart. This article and video from The Honest Carpenter will show you how to repair badly leaning fences. With just a minimum of tools and materials, you can get fences standing plumb again and keep them well-secured for the long run! A good 36″ WRECKING BAR, like this Stanley, is invaluable for demolition, pulling nails, and even digging! 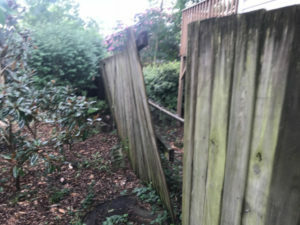 Badly detached and sagging privacy fence section. Fences tend to sag and fall apart when the vertical posts that anchor the fence to the ground either rot or come unseated. 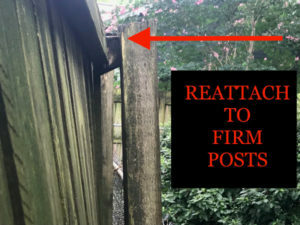 For this reason, you must often re-anchor old posts, or install new posts altogether, to get fences upright and secure again. Digging post holes is obviously a major part of this operation. But, digging around an existing fence can be difficult and frustrating! Once posts are standing, you’ll need to reattach the horizontal “rail” to them securely. I use a combination of gun-driven nails and long screws to do this. But, you can carry out the whole operation with screws alone using a drill/driver combo. 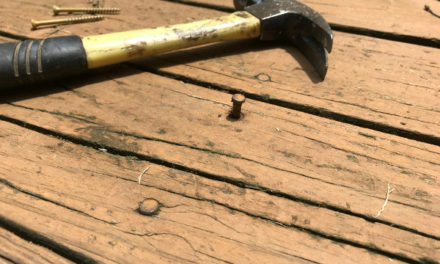 And, just make sure you’re driving 3-1/2″ exterior-grade screws for proper fastening. These extra-long, ceramic-coated screws provide full attachment and long-term weather protection. Repairing a badly sagging fence requires a triage approach. And the first thing you have to do is make sure it doesn’t get worse while you’re working on it! 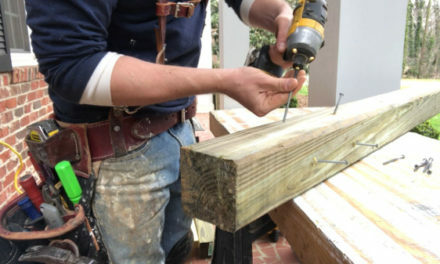 Go ahead and force your leaning fence into a vertical position by propping it up with 2×4 braces. Plumb up fence with 2x4s for leverage. This is really a simple process. 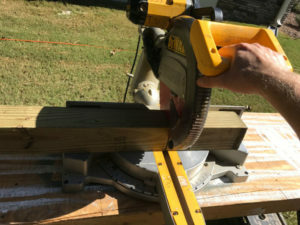 Just drive the heel of the 2×4 into the ground about 5′ away from the fence. Then, push the fence upright with your shoulder (or have a friend do it) and tilt the free end of the 2×4 against it. 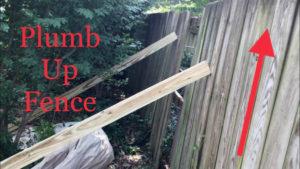 Pull down on the 2×4 to create more tension, forcing the fence into a true plumb position. Just note that you can scar the face of fence by shifting the prop lumber like this, so watch the surface of your pickets for damage. In some of these cases, the rails have detached, but the posts behind them are still firm and secure! 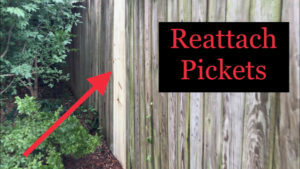 Reattach loose rails to firmly anchored fence posts. Just test existing posts by pushing on them from either side. If they resist force, you can probably just reattach sagging sections directly to them. Push or clamp the rails back into place against the post (with “quick clamps” if you have them) and secure them with 3-1/2″ screws. You may sometimes have to drive through surface pickets as well to do this, but a few screw heads are hardly noticeable in a full fence line. Look for posts with no decent anchoring. The fence will often rock or wobble badly around them. Check their bases at ground level to see if they have rotted away. Sometimes digging a little will reveal that the original concrete anchor was too shallow to support a tall fence. Digging will expose the existing concrete boot. In either case, a new post will need to be installed close to the current one. 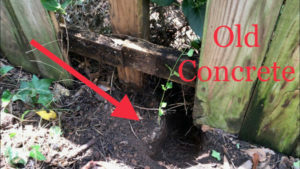 I will often leave the old post in place, though, to avoid causing more damage to the fence by removing it. 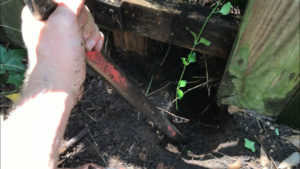 Dig out narrow post holes with a narrow pry tool. Digging post holes by hand is difficult in the best of circumstances. 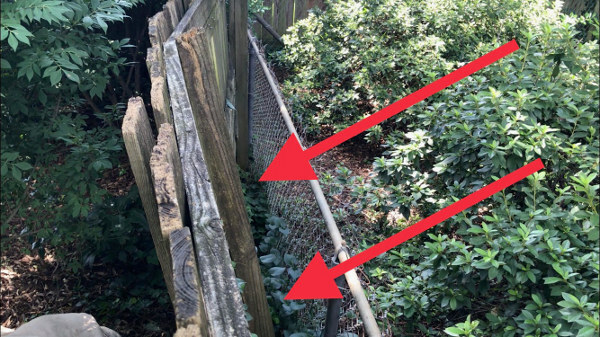 But, digging around an existing fence can be downright awful. Shovels and picks are of almost no use in these situations. They can’t be worked at an appropriate angle, and they create a hole that is too big. 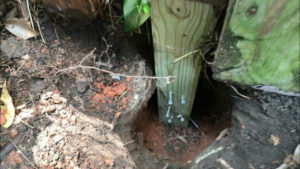 Post holes work best when they are fairly narrow (about 2-3 times the diameter of the post), and deep. For this reason, I like to use a long wrecking bar to gouge out the ground and bring it up in scoops. For a 6′ fence, you really want at least 2′ of post in the ground. 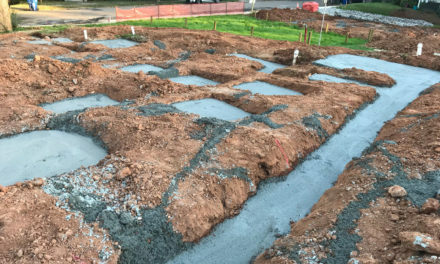 More is better, but hard clay and rocky soil simply may not allow it in some cases. Just keep gouging up the ground directly below the fence until you have a hole that you can barely reach the bottom of. It’s a chore, but stick with it! Pull a measurement up from the bottom of the post hole to the top of the upper rail. Cut a 4×4 post to this length and drop it into the post hole. Cut treated 4×4 post to length. Plumb the post up with a 2′ or 4′ level and fasten it to the rails using 3-1/2″ screws. Again, if you never removed pickets, you can simply drive screws through their faces into the rail and post. That’s pretty much all it takes to get the post in place. The connections between the rails and the original post tie the new post into the structure of the fence, and a new concrete boot will make everything secure. However, I like to take an extra step before pouring concrete by creating a “screw tree” at the bottom of the post to create better anchorage. Embed screws in post below grade for better anchoring. I wrote a whole article on stronger ground posts here. 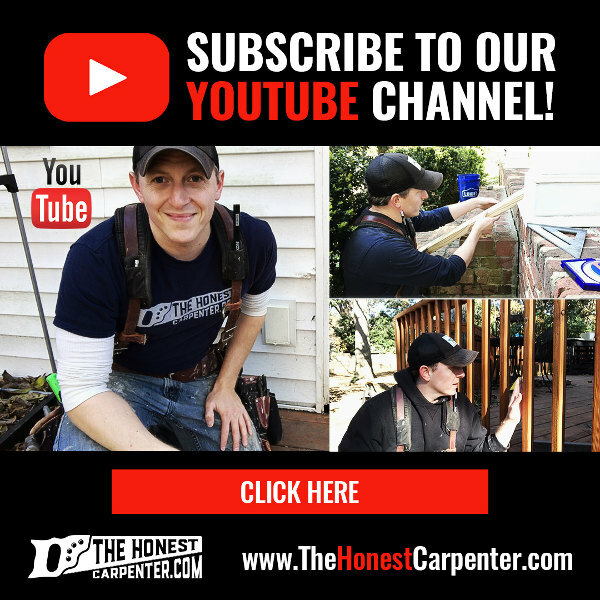 Check it out to learn more about this awesome construction trick! Bagged concrete mixture is a very versatile product, perfect for post anchoring situations like this. It can be mixed in the hole with just a little water. Or, some products can even be dumped in dry, and they will take on moisture and set up on their own! I like to mix the product myself just to get it to set up faster. 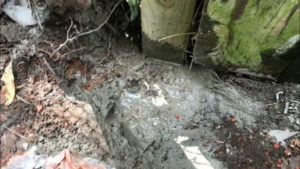 Concrete mixed in hole to anchor upright fence post. 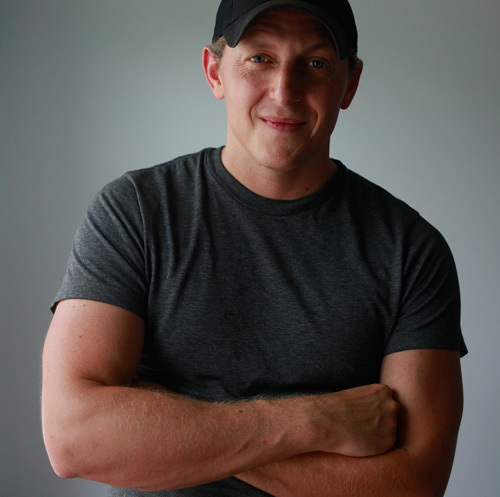 I start by pouring a little water in the hole, then dumping in half of an 80 lb. bag. I mix the water and compound together using, once again, my wrecking bar. Don’t overwater the mixture, though! You only need enough to create a dense slurry. When the first portion is mixed, I repeat with a little more water and the rest of the bag. I use the wrecking bar to force concrete into all the voids around the post, and to churn out air bubbles. I tend to fill the hole to within a couple inches of ground level. Reattach pickets to upright, repaired fence. If you had to remove pickets to set your new post, go ahead and reattach them now. 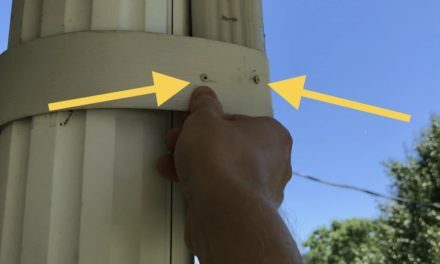 You can attach them by screwing 2″ exterior-grade screws directly through the faces of the pickets into the rails and posts. A couple screws per rail is all you need. Set the screws about 1 to 1-1/2″ in from the outer edges of the picket, and countersink them very slightly (set the heads below surface level). Upright, repaired fence with new pickets. Let the new concrete set up, then remove the angle braces. If it’s a particularly windy day, consider leaving them in for a full 48 hours! With your new posts in place and rails securely fastened to old posts, your fence should be firm and stable for years to come! PreviousCONTRACTOR, CARPENTER, WOODWORKER: WHAT’S THE DIFFERENCE?